This post is part of the TaxACT How I Save blog tour which teaches you ways to keep more money in your pocket. Last year, TaxACT saved America over $240 million on tax preparation. How much can you save? To learn more about tips and strategies on saving, click here. Saving is all a matter of living beneath your means. But many people who think they are doing so are simply surviving, financially speaking. Unless you are able to put away hundreds or thousands of dollars a month, you are actually living very near the limit of your means. In order to get the savings train rolling, it’s time to make some changes and watch our savings and investments start to pile up. 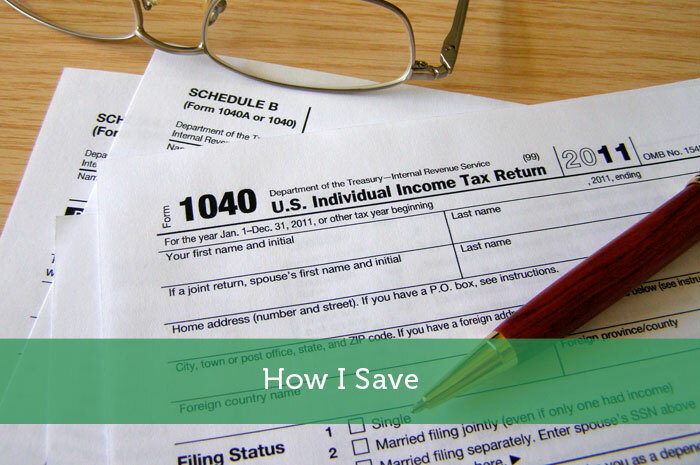 Here are some of the ways I learned how to switch into savings mode. They’ll work for you, too. The Jar of Spending Denial. At least that’s what I call it, written in Sharpie on scotch tape stretched across the front. Any time I want to go out to eat, go buy a coffee, make an impulsive purchase for my synthesizer collection, I have a little conference with myself. “Can I survive without this thing? Would I be better off just saving this money?” If I can talk myself out of making the purpose, I take the cash I was about to piddle away and put it into the Jar of Spending Denial. I don’t “win” the argument with myself every time, but I do often enough to save a couple of hundred dollars each and every month. This goes into savings, investments, whatever I need. The Side Hustle. This isn’t a manner of saving, per se, but it’ll get you to the same place. In order to stay interested in life, I find I need to be learning new skills all the time. Then I try to turn my hobby into something that’ll bring in a little extra money. Think of it like making your hobby earn its keep. For me, this has meant experimenting with a gluten free baking subscription service out of my kitchen, live musical performances for hire, and doing simple demolition in neighborhood houses. I don’t make a ton of money in any of these gigs, but by stepping out into a side hustle or two, I have brought in a little extra cash that can be saved, on top of the money I make in my regular work week. Plus, it’s fun. I would recommend it. The Wandering Hobo. Or that’s what I call myself now that I sold my car. I was spending over $100 a month on a 23 year old Jeep, something I drove not very much at all. The gas, the maintenance, the insurance, it all had to stop. I sold the vehicle and started walking everywhere. I took the extra $125/month, or so, and put it into savings for a serviceable bicycle. Thus outfitted, I no longer have to drag myself to my faraway destinations on foot, which is nice. Plus, now that I own a good bike, I can save that extra cash every month. It’s fantastic, and I don’t miss the oil changes and broken air conditioning at all. These are just three strategies that worked for me. In order to save meaningfully, you’ve got to make some changes. You just have to, or your savings will never materialize. Get creative, have fun, and make the most of your money. I love your jar idea. You are actually saving the money by not buying something instead of just using the money on something else. Also, props for being car free. I sold my car when I was a single lady, but we’re a single car family now. I miss those days, but out in the suburbs life is definitely easier with a car. Really cool ideas. We also save money in ‘jars’ and also our accounts. Husband set himself (and I joined) to a 25% saving resolution aside what we’re already doing. Great ideas. The jar is my favorite out of those three ideas, since it really works well. I don’t use a jar, but I do try to keep my wallet a little larger than normal, which helps when saving! Great Idea. I need to work more on #1 to perfect it but I find it really hard. I recently realized that it is more of the team work (with my wife) than solo work. Now, I just learned how you save money. But I’d like to focus on “side hustles”, your second point. I believe honing our skills and getting another that is in demand and making it a hobby or finding joy in it are really cool ideas that everyone should know. Right now, I am having a web-design tutorials as I know this skill earns a lot.